To issue an annual report on the state of the City’s streets and sidewalks as measured by evaluations. The physical unit of an evaluation is a “route”. 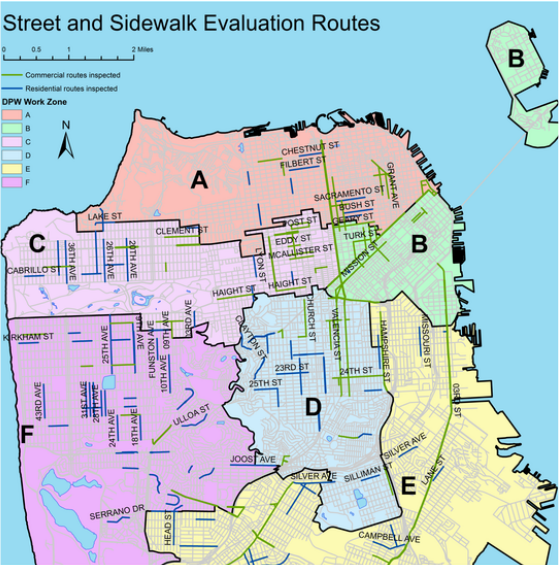 Each route consists of several contiguous city blocks, with one side of the street evaluated at a time. Each block consists of several contiguous 100-foot segments. Every route is evaluated at least twice on two different days during each fiscal year (July 1 through June 30). Where are the routes located? JBR evaluated a total of 183 selected routes throughout the City in FY 2015-16, providing data from 366 new evaluations from all 11 Supervisory Districts. Fifty-two percent of the routes were commercial and 48 percent were residential. JBR evaluated between 18 and 40 routes within each Public Works “work zone”, or administrative area. These zones are labeled Zone A through Zone F.
Zone F includes Districts 4 and 7.
Who is responsible for street and sidewalk maintenance? Among the twenty-two street and sidewalk standards evaluated, the Public Works department is generally responsible for the maintenance of the streets and Public Works assets located on the sidewalks. However there are a variety of properties and common assets that Public Works may not manage, or for which Public Works may only share partial responsibility with other property owners. For example, some light poles, traffic signs, electrical boxes, retaining walls, bike racks, street furniture, or other property on the sidewalk may be the responsibility of private parties (e.g. fronting property owners, community benefit districts, private utilities) or other public agencies (e.g. SFPUC, MTA, Recreation and Parks). While Public Works is not responsible for all aspects of street and sidewalk maintenance, the department does manage several outreach and engagement programs to proactively encourage private property owners and communities to maintain their local streets and sidewalks.